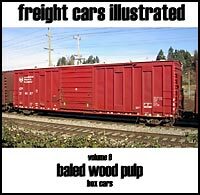 Dear Modelers; we came across an interesting company today who market great E-Books (on CD's) for modern freight car equipment. i.e. they are effectively modern freight car equipment guides. 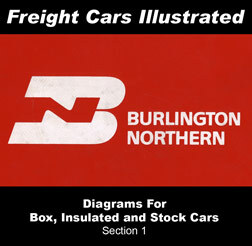 Over 350 diagrams of box cars, insulated box cars and stock cars, complete with series information, pre-merger owners/series, dimensional data, etc. Also includes pre-merger cross indexes with pre-merger series to BN series. 374 pages, black and white. Color photographs (roster and detail views) plus dimensional data, operating roads, series information as well as types of doors, hand brakes, trucks , cushioning, etc. Includes and introduction explaining the different sill styles and ends. 52 models are represented by over 375 photographs, in nine chapters covering single door, double door, single plug door, double plug door, quad plug door, combination door cars, and identification key, an abbreviation key as well as a listing of related magazine articles. 573 pages. 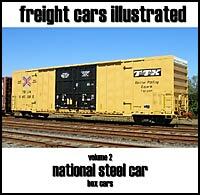 Over 250 images representing 28 models of box cars built between 1937 and 2005 by National Steel Car (NSC) of Hamilton, Ontario. Eight sill designs and ten end designs are covered as well as dimensional data, series information, build dates, appliance manufacturers, etc. Related magazine articles and an abbreviation key are also included. 343 pages. 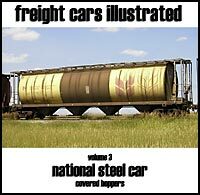 National Steel Car was one of the largest suppliers of Canadian-built covered hoppers during the Seventies and Eighties and continue to build covered hoppers today. Volume 3 covers 23 models of cars built between 1951 and 2006 with over 550 roster and detail photographs and include dimensional data, series information, build dates, appliance manufacturers, etc. Also included is a listing of related magazine articles, an abbreviation key and a listing of AAR Type Codes for the cars represented. 627 pages. 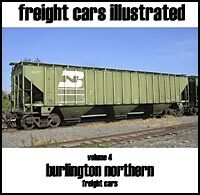 This volume of Freight Cars Illustrated covers a wide variety (over 700 photographs covering more than 150 models) of freight cars wearing BN reporting marks between 1974 and 2005. Everything from aircraft flat cars, to box cars, to insulated box cars, covered hoppers, coil cars, caboose, etc. An excellent resource for modeling BN during the late Eighties and Nineties. Data includes dimensional, series, built dates, appliance manufacturers, paint dates, etc. Also includes an abbreviation key and a listing of related magazine articles. 924 pages. 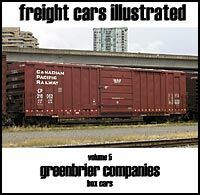 Volume 5 focuses on the box cars built by The Greenbrier Companies (which include Gunderson - Portland, Oregon; TrentonWorks - Trenton, Nova Scotia and Gunderson Concarril - Sahagun, Mexico). There's a discussion on side sills, ends and jack pads along with more than 375 photographs of 27 models of box cars built between 1988 and 2005. In addition to roster and detail photographs, there is dimensional data, series information, appliance models and manufacturers, built dates, paint dates, etc. 494 pages. 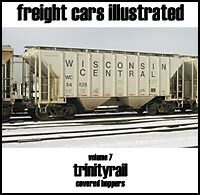 Volume 7 features covered hoppers built by Trinity Industies, Trinity Rail Group (Trinity's new name after merging with Thrall Car Manufacturing in 2000) and TrintyRail (renamed in 2004). There are over 675 images of 29 models of 2, 3, 4 and 5-bay cars built between 1978 and 2006. Along with roster and detail views, there is dimensional data for each model, as well as series information, build dates, previous owners, information on the types of hand brakes, outlet gates, trucks, paint dates, etc. Also included is an abbreviation key, an AAR Type Code key and a bibliography. 738 pages. FMC's roots go back to 1919 in Portland, Oregon when they were known as the Wire Wheel Sales and Service Company. 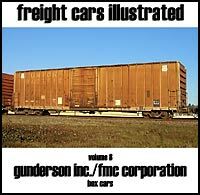 Volume 8 has more than 500 photographs covering 51 models of box cars built by Gunderson Inc. and FMC Corporation built between 1966 and 1983. There are roster and detail photos along with keys identifying the seven bolster fastener patterns utilized, the styles of ends incorporated and a discussion on side sill designs. Each photograph has a caption identifying the location and date of the photograph, series and build dates, door, hand brake and truck manufacturers, etc. 553 pages. 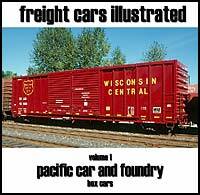 This volume covers hand brakes, trucks, sliding and plug doors, gravity, pneumatic and combination gravity/pneumatic outlet gates, box car and gondola ends and box car roofs with more than 750 photographs. There are photos of 63 models of hand brakes from 9 manufacturers, 24 models of trucks from 32 foundries (including foundry monograms), 4 types of doors from 20 manufacturers, 72 models of outlet gates from 17 manufacturers, 6 types of ends from 16 manufacturers and 17 types of ends from 6 manufacturers. Monograph No. 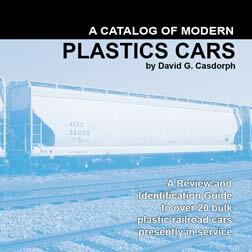 6 was originally published in 1994 and discusses the various designs of plastics cars by 11 manufacturers. Mr. Casdorph discusses the basic features of 18 major models and includes an in service roster and detail photographs as well as a set of Side Identification Diagrams useful for quickly identifying the various models. 148 pages, black and white. 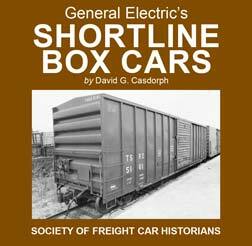 General Electric's Shortline Box Cars, Monograph No. 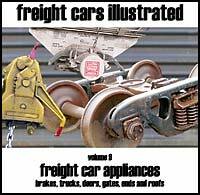 23 was originally published by David G. Casdorph and the Society of Freight Car Historians in 1994. It covers cars from 22 of GE's 68 (at the time) shortline railroads. Mr. Casdorph has included both roster and detail views in the pictorial section and a section of appendices that list the 68 roads (their reporting marks, number of cars and state[s] of operation), notes on paint schemes, current HO models and a list of GE's car shops. 45 pages, black and white.